Spin This: "What Lovers Do," "Help Me Out," "Wait," "Closure"
With only ten tracks aboard, it's Maroon 5's shortest set to date. It's also still missing the meat of their pop-rock playing. Since Overexposed, Adam Levine & Co. has been pushing out a more contemporary R&B-meets alternative pop aimed at youngster radio. And it’s worked for them. 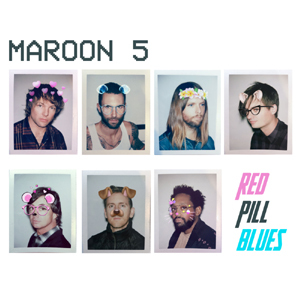 The departure from the college pop-rock of Songs About Jane and Hands All Over was clearly a risky move at first, alienating the fans of their early pop-rock phase, but the evolution of Maroon 5 into experimental rhythmic pop exemplified first with “Moves Like Jagger” and afterwards on V — a launch pad for Levine’s frontman ego and his now inescapable falsetto — helped them rack up a slew of Top 40 keepsakes (“Animals,” “Maps,” “Sugar,” “Don’t Wanna Know”). There’s no disputing that. Still, that sound, done with a bit of desperate appeal to stay relevant, doesn’t measure up with the wealth of goodness from their early works. On Red Pills Blues, they’ve managed to pull off a reset. It is possibly their most interesting album on record, despite a rocky start in its rollout. The album cover is silly Snapchat art and its title, despite its allegiance to Matric culture, sounds like an awkward rite of passage for the bubbling men’s movement aimed at heckling feminists. It’s also their shortest set to date, with ten tracks and only 39 minutes on deck. But deep inside are some very strong, memorable moments. Clearly the golden choice, “What Lovers Do” plays to the crowds that easily faint for Calvin Harris. It opens with cute melodic riffs similar to The Chainsmokers’ “Closer,” but it later develops into three minutes of joyous neo-disco all highlighted by Levine’s cuddly falsetto, SZA’s contributing duet and a bouncy beat. And as hard it is to prop Maroon 5 into a landfill of hard, aggressive club beats, the John Ryan-produced “Wait” does that and fulfills expectations. It doesn’t play like a typical Maroon 5 track, but that what makes it so alluring and hypnotic to the ear. The effortless, elongated “oooh” melisma tagged to the back of the chorus, plus the perfect inversion makes the cut a complete standout. There’s also the meaty opener “Best 4 U” that proves to be an album highlight due to The Weeknd-esque soul. The rest of the set is drippy millennial R&B and mellow pop showing off a Quiet Storm forecast, kicking off with the Charlie Puth-assisted “Lips on You.” It continues on with the neo-soul lullaby “Whiskey” and the breezy melodic “Girls Like You.” These contributions, along with the subdued indie-pop on the Julia Michaels-featured “Help Me Out,” feel like new territory for the commercial-hungry band. But the group clearly saves the best for last. “Closure,” a mid-tempo groove, stretches across eleven minutes and does the unthinkable in a Maroon 5 universe. It’s the longest track in their entire anthology, with the first three minutes playing out like a radio-ready single. Everything afterward resembles a mellow instrumental funk jam conspired in Prince’s paradigm. It is the actual band, calmly riffing on Rhodes and psychedelic guitar sparks, that makes all of this possible. There are no big guitar crescendos or any more of Levine’s ad-libs in that final segment. It’s just a gracefully extended jam session. What would’ve easily set it off would have been some Prince-inspired guitar action, but it’s quite an ambitious addition to the set, pushing the 21st-century disc into a glorious easy-listening throwback design that clearly walks back to the glory days of the LP era. Things here still aren’t enough to supersede their groundbreaking Songs About Jane, a disc that celebrates its fifteenth anniversary this year, or topple the hit-carrying arsenal of 2007’s It Won’t Be Soon Before Long, but their innovation towards ambitious leanings are worth noting. Instead of trying to be grossly hip and hyper-anxious for a heavier crossover, they’ve somehow discovered a sweet balance that pleases both their younger and older fans. In the meantime, the music on here – ripe with cinematic pop, smooth ballads, rhythmic advances and sing-a-long lyricism – will probably age better than anything they’ve put out in the last four years.